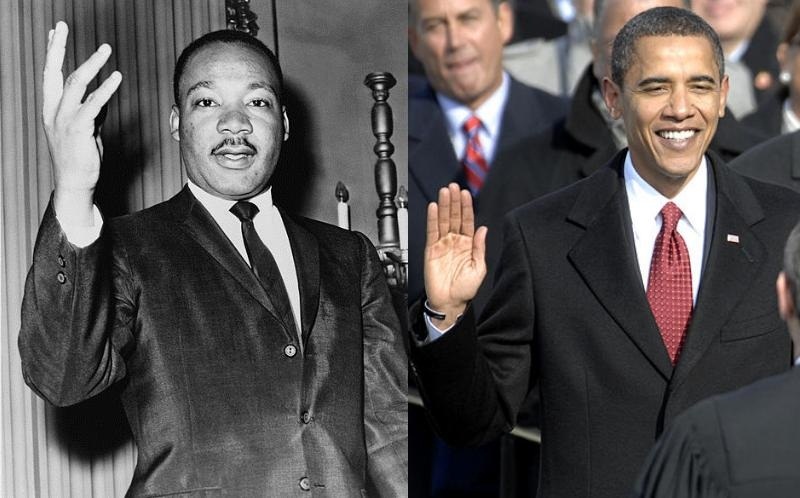 January 21, 2013 Today is only the second time in history when the Presidential Inauguration and the federal holiday for Martin Luther King Jr. converge. Making this day even more historic is that Barack Obama, the first African-American President is being sworn into office on a day dedicated to a man who dreamed of the day when African Americans could reach their goals without race being a barricade. Martin Luther King Jr. Day is a federal holiday celebrated on the third Monday of January even though his actual birthday is January 15. Dr. King would have been 84 this year. This holiday was first celebrated 27 years ago on January 20, 1986; after Republican President Ronald Reagan signed the bill into law. Dr. King believed in giving back to communities and taking action to help make your life and the lives around you better. He believed in volunteering and being part of the solution to create a better America. In fact, this federal holiday has been linked to service since its inception to honor Dr. King’s legacy. With events in every state and over one million hours of services pledged, event organizers for the National Day of Service, hope this is just the beginning and Americans will continue to give to their communities. President Obama has been quoted saying, “This year’s inaugural will reflect our belief that working together, we can keep moving our country forward and fulfill the promise of the American dream for all families”. This year is also the 50th anniversary of the Civil Rights March on Washington, which was one of the major turning points in America’s history. This was one of the largest political rallies centered on jobs and freedom. On Wednesday August 28, 1963, over 200,000 people stood in front of the Lincoln Memorial to hear Dr. King deliver his “I have a Dream” speech. With today being the ceremonial inauguration day for President Obama, the real one haven taken place on January 20th, his inauguration speech will provide some further insight into the next four years. With great expectations, many American’s are hoping that the speech is followed by actions just like Martin Luther King’s speeches were great but his actions greater. 2013 is showing many similarities to 1963, with the American public looking to their government to take action. Just like the Civil Rights Movement in the 1960’s, Americans today want to see change in the political environment. They want to see politicians working towards a goal to improve America’s future. July 9th in African American History – James L. Farmer, Jr.